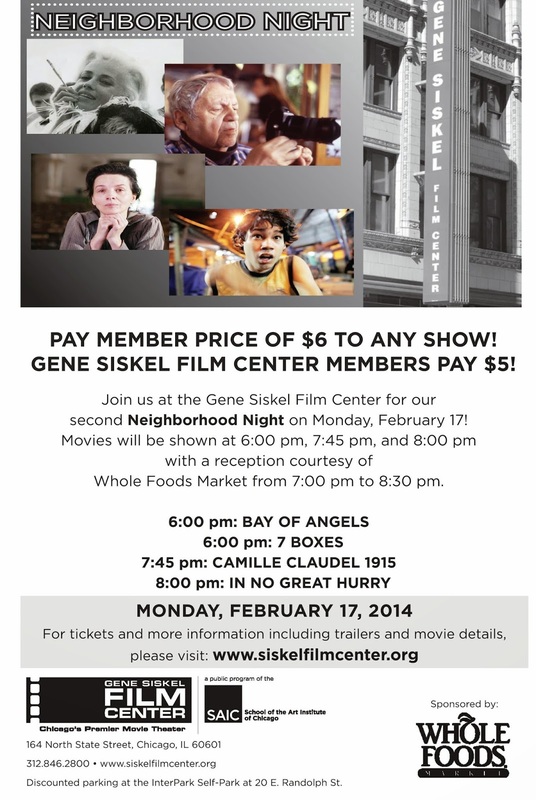 enjoy member ticket prices for the night, paying only $6 per screening, while Film Center members pay $5. A reception courtesy of Whole Foods Market will run from 7:00 p.m. to 8:30 p.m. A wide array of films are scheduled for the evening: BAY OF ANGELS (6:00 p.m.), by director Jacques Demy, an elegant French tale of love and destruction; 7 BOXES (6:00 p.m.), a humorous Paraguayan thriller; Juliette Binoche in Auguste Rodin biopic, CAMILLE CLAUDEL 1915 (7:45 p.m.), directed by noted filmmaker Bruno Dumont; and IN NO GREAT HURRY (8:00 p.m.), a documentary by Thomas Leach that focuses on the late pioneer of color photography, Saul Leiter. For tickets and more information, visit www.siskelfilmcenter.org.